Posted on April 8, 2019 April 8, 2019 by Timothy Minor Jr. I recently read an article by Cassidy Kakin that I couldn’t resist sharing with you all. His words were all too familiar, as a working adult, whose escape from the reality also stems from the impact of music. I’m pretty sure we’ve all woken up in the morning, dreading going to work as each hour creeps closer to the time we have to be there. “Do I really need this job?” we think. “Oh thank God, I’ve got two more hours until my alarms clock goes off” In America, it has become common to live only for the weekends, but why? Cassidy explains how the “American Nightmare” weighed heavily on his energy, his psyche, and his happiness, and what he did to reclaim all of these things. Give it a read, I promise it’ll be worth it. Since then, I’ve been a whole lot broker but also a whole lot happier. “When I was 23, my mother-in-law to be was proud of me. I’m two years older now, carrying a few pounds less stress and a few dozen more complexes when I wake up in the morning, and that notion disgusts me. A lot has changed; new jobs, new relationships, new addresses have come and gone. Old friends with new homes and new wives. New perspectives. New hip-hop. Looking back, I can trace the first domino in all those toppling transformations back to the morning I quit my Silicon Valley tech job. And the night before, when Kendrick Lamar dropped To Pimp a Butterfly. Rewind to February 2015, the first time I felt like a big kid. I’d been out of school and living on my own for two years, but by the end of that cruel winter, everything was different. I’d found my pocket. Professionally, romantically, it all looked on the surface like things were lining up. The soundtrack was golden too. Joey Bada$$ stumbling into his grown man swagger right alongside me, Run The Jewels giving all of us young old heads faith in the culture. More powerful underground music than I’d ever swam in before, doing more for my heart and soul than I’d ever thought to ask for. Something was wrong, though. Something was missing. A grating feeling, like I wasn’t who I was supposed to be, started to work its way deep between the cracks in the paint covering the white picket fence in our tidy San Jose suburb. And it took To Pimp a Butterfly for me to understand why. To imagine that my struggle as an upper-middle-class white college graduate living in the Bay and smoking too much weed shared any DNA with Kendrick and the demons he was battling is naive and bordering on cultural sacrilege. But I heard his words like I was staring at myself in the mirror, tasting the same anxiety and self-doubt that lingered in the back of my throat that Kendrick was trying to drown out in that hotel room. March 2015, I was the COO of a small Silicon Valley angel-funded tech company that builds designer bike lights worth more than my dental visits. I was good at my job, but I wasn’t sure why, and nothing made any sense. To this day, I have no idea why my boss’ patent was worth millions of dollars, or why I was trusted with a company credit card when most months I lived on the wrong side of my checking account’s overdraft line and treated my FICO score like a game of Russian Roulette. I had everything that the TV had ever told me I wanted, and none of it tasted right. The soundtrack was turning rotten. All the artists I loved looked scared. I remember feeling nauseous every morning, hearing about another death in the black community, another cop getting a paid vacation, another stain on my comfortable millennial ideals. And I remember feeling anxious, like none of the community leaders I looked up to had the guts or vision to make the music I needed to hear addressing all of that fear and hurt. Then, on March 15, Kendrick dropped. To Pimp a Butterfly, starting with the opening track, felt as abrasive and refreshing as a Sprite wrapped in sandpaper. Around midnight on the 15th, I was laying in bed, staring at Twitter and hating the idea of work in the morning like the rest of us. A few minutes later, TPAB landed in my iTunes folders, courtesy of its famously bungled release job, and I remember thinking as much about Huey P. as 2Pacalypse Now. It felt like a weight was being lifted; like I was drinking my medicine for the first time in years. Kendrick rapped “I need forty acres and a mule / Not a forty ounce and a pitbull” and I felt like the trajectory of mainstream hip-hop was changed forever. Like I was witnessing history. By 3 a.m., I’d squeezed in two back-to-back listens of TPAB‘s neo-fusion odyssey. Staring at that ticking clock and thinking about all of the emails I had to send in the morning, I walked myself through shutting my laptop and taking off my headphones and pretending like I cared about anything other than the voice of my favorite poet speaking truth to power. But, of course, I pressed play again, diving a layer deeper into the radical mind of the artist just as revolutionary. From “How Much a Dollar Cost” to “Alright” to “Mortal Man” to “Complexion,” Kendrick refused to take the easy way out. These were protest songs for the people, not for TV endorsements. They were real images, not packaged politics. 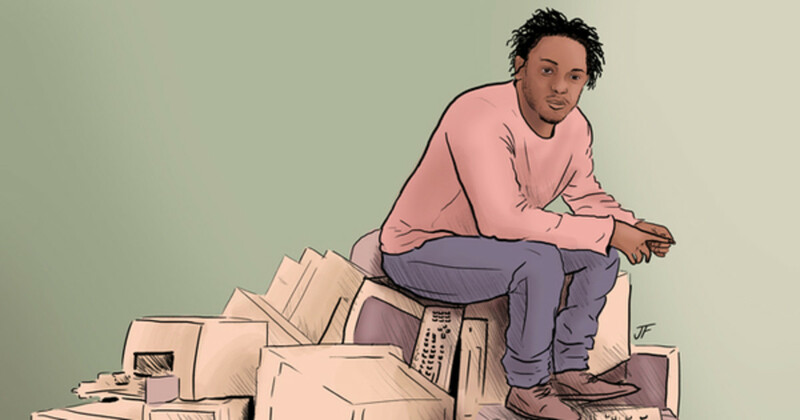 I thought about Kendrick’s world, before and after fame, and I thought about what it meant to swing so hard for the fences as a major label artist with everything to lose. I thought about his unwavering convictions. Kendrick stared White America in the eye and showed us his scars. Halfway through my third spin, as the hands on my clock were nearing 4 a.m., the prospect of my 10 a.m. budget meeting became the furthest thing from my mind. I’d been complacent, volunteering on the weekends and writing some rap think-pieces here and there, but otherwise totally detached from everything that inspired me. I knew the stakes were high, and that I wasn’t doing enough. I convinced myself that that was ok, that I had done my time and worked hard and deserved to live with whatever luxury was left after the rent and average self-destructive habits took their financial toll. Yet, here was Kendrick. One of the most important figures of his generation. Taking the blame. Accepting that he hasn’t always been the leader he knows he should be. Looking in the mirror and seeing a 360-degree view of himself and resolving to cast out the lie that says we deserve to love every bit of ourselves, even the parts that don’t trust in who we can be. By the fifth spin, with the clock reading 6 a.m., I didn’t have any illusions about showing up to a meeting at a job I didn’t care about. By the fifth time “Mortal Man” rang out, Pac’s voice cutting through whatever sheets of self-deception were still hanging on like a chainsaw through a Jell-O mold, I knew I didn’t ever want to go back to work. That morning, I called my boss, turned in my two weeks notice, and was told politely that I should shut the hell up and chase my dreams sooner than that. That same morning, I also published a review of To Pimp a Butterfly that made me feel hungrier than I ever had for a life of thinking about rap and art and politics full-time and figuring it out along the way. Since then, I’ve been a whole lot broker but also a whole lot happier. I’m nowhere near where I want to be, as a leader or a man or a member of my community, but I’m a lot closer than I was two years ago, staring in that mirror with Kendrick and finding reasons to hate myself. To Pimp a Butterfly is an objective classic. More importantly, as it pertains to my own life story, it caught me at the right time. Kendrick showed me how to be a version of yourself that doesn’t hide from the nuances; his commitment to creating the album he wanted at a time when that album was needed inspires me to this day. I don’t think that I’ll ever fully move past that morning when I made that phone call. Sitting there in my bed, iTunes on repeat, wrapped in blankets, but warm most of all with passion and the certainty that the right artist could change the world. Even if that only happens one late-night bender, one phone call to your boss, and one abandoned career at a time. Kendrick helped me to appreciate who I am and who I hope I can become. Quit your job for an album listening session and join me in figuring it out, and I’ll see you in the “thank you” card aisle whistling K-Dot. Right?! I think, in all honesty, we know in our beings when we are somewhere that we shouldn’t be. When you are, the place drains every bit of energy that you have.